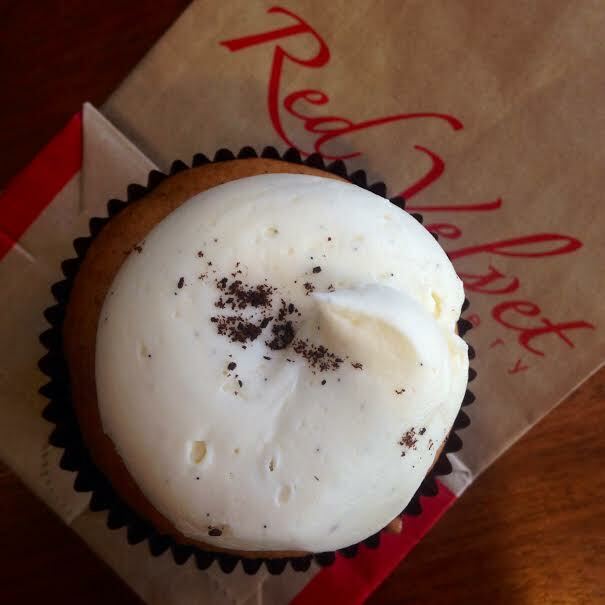 Red Velvet Cupcakery | Gluten Free D.C.
What I got: Gluten-free white velvet cupcake. This cupcake was just ok. I never have high expectations for gluten-free baked goods, though, and cupcakes are especially tricky to get right. The vanilla frosting was the best part. Gluten-free friendliness: The white velvet is one of two gluten-free options, the other being the original black velvet. Both of these flavors are also vegan. The Whole Gang has a great article that dives further into Red Velvet’s gluten-free operation. Overall vibe: The Penn Quarter location is a fairly small space. It did look like there was a renovation going on to add more seating. I don’t need that much space to stuff a cupcake in my face, but it’s not the place to bring a large group of friends. The spot is fairly close to the National Mall, though, and cupcakes are always a great addition to a picnic. Plus, it’s a good dessert option to keep in mind now that FroZenYo has closed their Chinatown location. This entry was posted in Penn Quarter, VA and tagged Bakery, Cupcake, GFDC, Gluten-free diet, Gluten-free food, Gluten-free foods, Red Velvet. Bookmark the permalink.